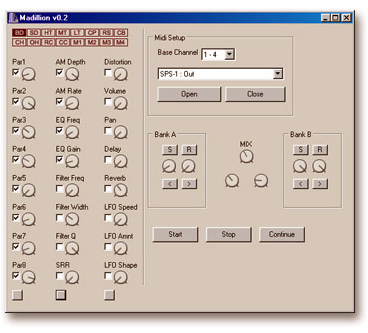 Madillion is a tool to edit machines on the Machinedrum SPS-1 from Elektron. It's design is based on the SPS-1 Machine Maker program written by Andrew Garber for the Mac OS X platform, but I have added the preset patches and the mixing features. The program is freeware and can be downloaded here. Madillion is based around two 'banks' (bank A and bank B) each filled with the same 16384 semi-random factory preset patches. You can browse through these patches by turning the appropriate knobs (two for each bank) or by pressing the 'next' and 'previous' buttons located under these knobs. By turning the 'mix' knob you can make a mix between any two of these factory patches. When you have found an interesting mix you can store it in any of the two memory locations by pressing the 's' button. You can then select another factory patch and make a mix between your stored patch and this next factory patch, etc. etc. Tweaking your patch until you are satisfied with the results. Version 0.2 introduced two additional mix knobs, located below the main mix knob. Since the main mix knob is a cross-fade knob parameter values will always stick nicely between the values indicated by bank A and bank B. Parameter values therefore tend to be a compromise between bank A and bank B. To explore the more extreme parameter values these two new knobs have been added. Just experiment and find out how they work. When these knobs are in centred position they will have no effect on the main mix.